All Slideshare slides are available at http://www.slideshare.net/event/free-as-in-freedom-miniconf-linuxconfau-2009/slideshows and you can also download plain pdf slides if you like. They’re all available under the CC-BY-SA license. Video has not yet been released but I will post again when it is available. Thanks to Ross Turk for letting us use his equipment, and Hamish Taylor for filming – it’s very, very much appreciated. If you attended, and you took pictures of any of my speakers and published them on the web, let me know and I will add links to my photos page. Also, if you attended, I would appreciate it if you could take the time to fill out my feedback survey. It’s short and anonymous. First up was Arthur Sale talking about open access and progress in Australian universities under the “green road”. He explained that the only way to make open access a reality is through a “distributed” model of institutional repositories (IR), because it’s the institutions that employ the researchers and thus have the power to mandate something. Students or researchers in universities might be interested in checking out the Wheeler declaration, and finding ways to pressure their university to adopt an OA mandate. Next up was Laura Simes on future directions for copyright law, which looked at the mixed messages we are getting at the moment from the government, with the Anti-Counterfeiting Trade Agreement looking like a disguised booby trap on one hand, and the encouraging words from the National Innovation Review, and other government departments exploring the use of free licensing, on the other. ACTA is far from dead, so if you’re interested in the topic I would suggest keeping your ears out for ways to help oppose it, over the coming year. Next up was Matthew Landauer on his project OpenAustralia. This was a repeat from OSDC and a popular one at that. What a great project – powerful idea and open source. Hopefully more good news will be coming from that direction in 2009. After Matthew was Liam Wyatt with Gratis & Libre, talking about ways that “free as in freedom” has been restricted in history: restricting access, censorship and destruction. I particularly like slide 19 in his set: it shows decaying film rolls. To copy them for the purpose of archiving would be illegal because they are copyrighted, but without being copied they are doomed to destruction through physical decay. His talk went over surprisingly well, given how technical LCA usually is — guess there are a number of history geeks amongst us too. Last one before lunch was Jessica Coates with Freedom Fighting: How do we convince TPTB to relax their grip?. Jessica put this together virtually at my direct suggestion, because I know Creative Commons Australia has done lots of excellent quiet lobbying with government departments in particular. Just look at the ABS decision to put everything CC-BY. Government departments just don’t make awesome decisions like that all by themselves. :) So if you’d like to do a bit of lobbying for your cause, this talk should be helpful. Heading up the afternoon sessions was Sarah Stokely on citizen journalism. She pointed out some of the pitfalls for online journos and also the great potential for society that citizen journalism as an activity has. you can’t get your photos easily out of Facebook. your teenage-years diary, which you wrote in early Word, is no longer properly accessible even through Microsoft’s own products. After Jeff was another hit session, Simon Greener on Free and open geodata in Australia. This was a great “cliff’s notes” introduction to what geodata refers to, who the providers in Australia are, and a number of open source or open source-like projects in Australia to extend such collections. Simon has many years experience in this field and it really showed in his talk. He spend some time talking about accuracy, and was critical of projects such as OpenStreetMap for re-creating road networks from scratch, instead of concentrating on what he saw as more useful — Point of Interest (POI) data. He skipped over the section in his slides on licensing, since time was short and that part would be generally well known. I think the technical detail in this talk was particularly appreciated by the audience. Second-last to the plate was Claudine Chionh on Public history in the digital age. She talked about two projects that she works on, Founders and Survivors which is about connecting family history with convicts records, and a yet-to-be-launched wiki-based project on Goulburn Valley local history. (I found out that I was born in the Goulburn Valley, so I can add that vital info when it launches ;), but I only lived there for a few months as an infant.) The Founders and Survivors project has a write up in the paper today which is an interesting read. Last, but certainly not least was another “star” speaker, Rusty Russell on Free as in Market. It was an angsty rant on the joys of property rights, about how the definition of IP was “digital cropburning” (destruction of rights), ending with an interpretive dance on software patents. Thank you to: all my speakers. Thank you for the awesome work you do for your projects, and thank you for your willingness to come to LCA and spread the word. Many of you I forcefully recruited, and thanks for your willlingness to be so recruited. Thank you to Nick Jenkins, Donna Benjamin and Rusty Russell for encouraging me to run this. Thank you to the LCA organisers to accepting it, and thank you to the audience members who came along. If you didn’t get to make it, please check out the slides, check out the video (when it arrives), and help these ideas spread! 12:00 Jessica Coates – Freedom Fighting – how do we convince the powers that be to relax their grip? 15:15 Jeff Waugh – We are the translators! I think the lineup is a good mix of LCA “regulars” and outsiders — well, maybe half the speakers are people who would not think to attend LCA, I guess. So for that I am glad, because that kind of crossover/multidisciplinary area where the most interesting ideas are often found, IMO. When we are exposed to other fields outside our own, we can see which patterns we are familiar with are actually very general, and which are specific. It helps stop us from thinking that we are encountering everything for the first time ever. I’m so excited to have such a wonderful range of speakers. I can’t wait!! I have excellent news. Miniconf speakers will be able to get free day passes to attend the miniconf days (Monday & Tuesday) of the linux.conf.au (LCA) conference. 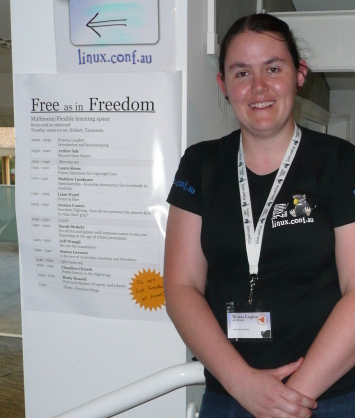 (LCA is Australia’s national, technical Linux + open source software conference. Miniconfs are semi-independent themed events held before the main conference.) This is great if you are interested in sharing your passion with a freedom-loving techy audience, but not so interested in the intricacies of Linux and free software yourself. Of course, if you are interested in such intricacies, then you should register for an Early-bird ticket now. These will last until November 3rd or sold out. So… if the Free as in Freedom Call for Participation has caught your eye, weigh up your options — consider just attending the miniconfs, for free — and make a submission ASAP! Are the original ideals that motivated the free software movement still relevant today? What makes Wikipedia a truly “free” encyclopedia? How are governments licensing public sector information? Is having an “open source” Facebook or Skype important? How do the current copyright and patents systems affect innovation and digital culture? How can educational resources be pooled and shared more effectively? Does citizen journalism matter? How are open access policies changing academic publishing? What are the potential pitfalls of all these trends towards “openness”? The Free as in Freedom miniconf, running for the first time in January 2009 at Linux.conf.au in Hobart, Tasmania, invites speakers to answer these questions, and more. This is not a comprehensive list – talks on related topics are also encouraged. Talks may be overviews, case studies, stories of personal experience, etc. They may be focused on technical, legal or social/community aspects, or a mix. Talks that relate multiple topics are especially welcome. Submissions are welcome for 25 or 50 minute slots (including question time). If there is sufficient interest a lightning session of 5 minute presentations may also be held. Presenters are encouraged to publish and license any submission and/or their slides under a free content license, e.g. CC-BY-SA, CC-BY, public domain dedication. Important: Please note that in order to give a presentation or attend the miniconf you must be signed up for the main Linux.conf.au conference. Presenting at the miniconf does not entitle you to discounted or free registration at the main conference nor priority with registration. any other requests or information relevant to your proposed talk. Submissions made by October 31st will be notified by November 7th. Submissions made between October 31st and November 10th will be notified by November 20th. See http://freeasinfreedom.modernthings.org/ for further information and updates. Any unanswered questions can be asked via contact@freeasinfreedom.modernthings.org. Free as in Freedom LCA miniconf accepted! LCA miniconferences have become a feature of Linux.conf.au, giving passionate members of the open source community a chance to collaborate and build momentum and interest on specific areas in open source. The miniconfs will run two days before the main conference on the 19th and 20th of January 2009, and will provide delegates with a chance to mingle with recognised experts in each of the areas covered by the miniconfs. “The Business of Open Source Software” is another brand-new miniconf and I will be really interested to see what it holds. I also like that the MySQL miniconf has morphed into a general databases miniconf; I’d like to see something SQLite-ish. Multimedia will also likely grab my attention, and Sysadmin and LinuxChix will be their usual interesting selves, too. The phrase “Free as in Freedom” reveals the heart of the free software movement as the desire to create a better society by sharing information. In the case of software, that information is code. Prominent causes underway today have taken their cue from the free software movement: from the idea of improving society by sharing information. We have much to learn about each other’s successes and failures. This miniconf is about acknowledging the connections between the free software movement and the movements it has inspired, and learning about our various successes and setbacks. In short, it is about Sharing.